KawaiiPunk - Kawaii Mascot Blog: Borked Planet! Creature Creations! It’s called Borked Planet. 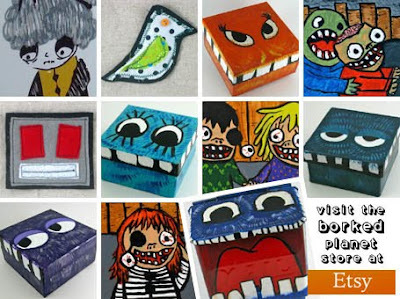 Borked Planet is a fantastic Etsy shop that specialises in crafty creature creations. It’s got robot patches, ghostly greeting cards, zombie paintings and, most importantly, it’s got monster boxes to keep all these cutely creepy crafts safe and secure. They’re also just the thing for keeping all your hard earned Halloween treats away form greedy little brothers and sisters! Or mums and dads for that matter! Enjoy!